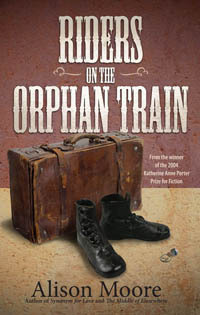 Riders on the Orphan Train chronicles the lives of two children among approximately 250,000 young people "placed out" between 1854 and 1929; boarding trains in New York City and literally given away at rail stations across the country. A brief encounter aboard the same westbound train makes a lifelong impression on a pair of 11-year olds, Maud Farrell and Ezra Duval; and while theirs are different stories, the two share an enduring connection. Their lives unfold in a loose braid across the Ozarks in Arkansas, the Big Bend area of West Texas, the Belen Harvey House in Belen, New Mexico and the mining town of Clifton, Arizona in the time before and during World War I and the decades that follow through the Great Depression. From the teeming streets of New York among a crush of immigrants; through the winding down of the old West; the dustbowl Riders on the Orphan Train is a story of the search for home, of dislocation, of loss and the rapidly-changing quality of American life. 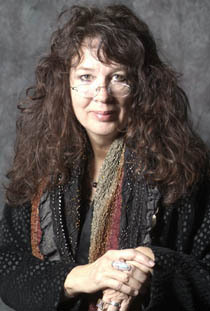 Alison Moore is a graduate of the Warren Wilson MFA Program for Writers and a former Assistant Professor of English/Creative Writing in the MFA Creative Writing Program at the University of Arizona. She is the recipient of two National Endowment for the Arts fellowships in fiction, The Katherine Anne Porter Prize for Fiction, and the J. Frank Dobie/Paisano fellowship from the University of Texas at Austin. She tours nationally with a multi-media presentation about the orphan trains. That production is now the official outreach program for the National Orphan Train Complex Museum and Research Center in Concordia, Kansas. Sign up for e-mail updates today and you’ll receive notices of news, events, and promotions. Alison travels throughout the United States and visits some very interesting places. Check out her Tour Journal, for news from the road. Alison completed "Riders on the Orphan Train" with a 2010 National Endowment for the Arts literature fellowship for prose.